Americans spend $50 billion each year on products and services designed to help us lose weight and get in shape. We’ve seen a host of startups proposing alternative methods to encourage us to stick with out fitness regimens, and today GymPact is launching a website and iPhone app that uses those old behavioral economics to help us to do just that. 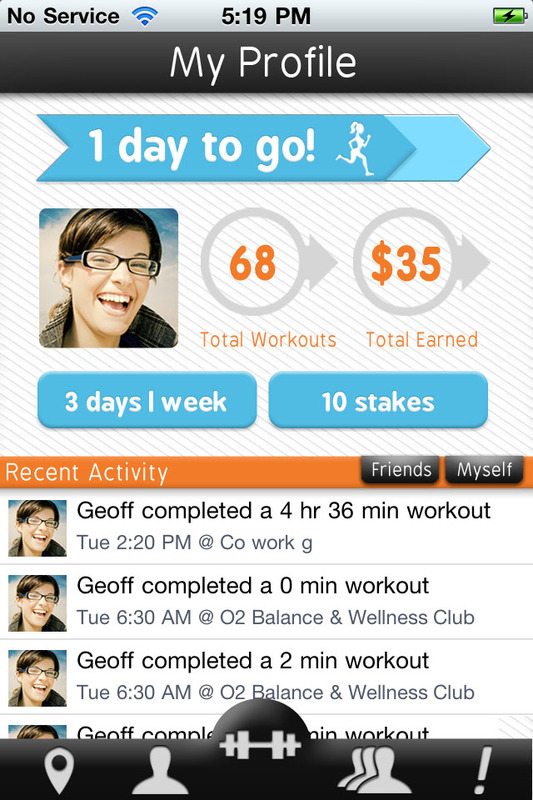 Simply put, GymPact is a check-in app that offers cash incentives to get you off the couch and into the gym. The service gets you to create a “Pact” over how many times you’ll make it to the gym over the course of a given week, and how much money you’ll be willing to fork over if you don’t meet that goal. When users live up to their pacts (by way of checking in at the gym on their phone), they earn cash rewards, paid for by those lazy people who didn’t fulfill their quotas. If they don’t, they pay that $10 to the community. If you do meet your goals, the startup gives you cash rewards from the collective pot of those who didn’t meet their goals, with GymPact taking a fee whenever it pays out to people who got to the gym. And to discourage drive by check-ins, users must stay at the gym for at least 30 minutes for their check-ins to count. (And it has GPS checks in the background that auto-check you out when you leave the gym.) However, Pacts are made on a weekly basis, and users can change or freeze their pacts until Sunday night, when GymPact tallies your total attendance. The idea for GymPact came out of a behavioral economics class Co-founders Yifan Zhang and Geoff Oberhofer took while at Harvard, which led them to run a 6-month trial of their idea starting in early 2011, beginning with a handful of gyms in Boston. Over the course of the trial, the founders received messages from interested parties across the country asking to bring GymPact to their city. At which point, Zhang said, that the team realized that they wouldn’t be able to scale fast enough by partnering with gyms, so they decided to become a platform company, allowing users to check-in to any gym via GPS verification from their iPhones. Zhang said that the team has found that fitness apps tend to fall into three buckets: Data trackers (like Fitbit and Runkeeper), virtual trainers (like Gain Fitness, which we covered last month), and motivators. Being of the last category, Zhang said that she has been meeting with other fitness entrepreneurs over the last year, and thinks that GymPact can be a great complement to data trackers and virtual trainer apps by incentivizing people to actually get up and go to the gym (or yoga, to the pool, or spin class). So, rather than focusing solely on rewards like badges, points, prizes, or even cash, GymPact is betting that the real driver of behavior is negative motivation — that people are motivated more by loss than by gain. Pavlov and I, on the other hand, just prefer to ring a bell. And ply with treats. However, through this negative approach, GymPact saw its users going to the gym on 80 to 90 percent of their committed days during its six-month trial. Apparently, just a $5 commitment is enough to get people to the gym three or four days a week, Zhang says. And the $1 average for cash rewards isn’t much, but it’s enough to reinforce that achievement. That small change can add up. Of course, that’s reasoning meant to assure you that you won’t have to put a whole lot of money down on GymPact or your own fitness; in other words, that it won’t bankrupt you. (On top of what you already pay for gym membership.) So I’d like to see a little more in the way of assurance that users won’t be subject to fraud, or false check-in crap. And just how precise they can be in determining whether or not users stay at the gym for 30 minutes at a time, and in what location? Have they discovered something that other check-in LBSes haven’t? If not, it’s a slippery slope. GymPact’s approach is similar to another startup we wrote about recently, called HealthRally, which also seeks to offer motivation through cash incentives, yet instead by way of peer, er, social pressure. Excuse me, “incentive”. Users make pledges to their close friends and family by way of social networks, with the idea being that you’re more likely to get in shape when your loved ones are scrutinizing your plans — and offering rewards. Though HealthRally is still in private beta, these two startups are experimenting with flip sides of the coin, and it will be interesting to see which idea users find provides them with more motivation: Social pressure, or the prospect of “losing” money. Both are enough to scare me into doing some sit ups, that’s for sure. But HealthRally is in the advantageous position of being able to watch and see how users react, and adjust accordingly. We shall see. Check out GymPact on the Web here, or on the App Store here, and let us know what you think. GymPact will be rolling out on other mobile platform in the coming months. Stay tuned.